Roush Performance Products offered both performance parts and turn-key Mustang conversions. They had the Stage 1, Stage 2, and Stage 3 turn-key models for 2005. Stage 1 for just an appearance package. Stage 2 adds a suspension upgrade. Stage 3 added performance - a supercharger! This Sonic Blue, 4.6L supercharged V8, 2005 Roush Mustang coupe is owned by Scot LaSyone of Tulsa, Oklahoma. It was our featured Attitude of the Week for the week of April 11, 2010. Check out the Roush body panels, hood, and custom wheels. 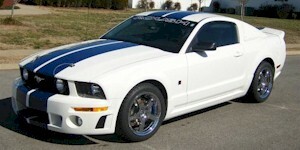 Performance White 2005 Roush Stage 1 Mustang coupe with double blue stripes. Check out the Roush windshield decal. This one is even signed by Jack Roush. Mineral Gray 2005 Roush Supercharged coupe serial number 05-1182 with roush front air dam, roush lower side panels, rear window quarter window panels, roush wheels, black over the top stripes, and a supercharged modified engine. The engine modifications include an ATI pro charger kit, P1SC unit with 3 core air to air intercooler, 39.5 pound fuel injectors, 2007 Shelby GT 500 duel fuel pumps, JBA long tube ceramic coated headers with fire cone merge collector, JBA off road H pipe ran to the Roush mufflers, and Ford racing 4:10 rear end gears. Redfire 2005 Mustang Roush Stage 2 coupe with a supercharger. Awesome shot eh? The front grille and fog light surrounds are also painted Redfire. This is a Roush factory conversion - serial number 05-0071. It has a black interior with red seat inserts. It wears a set of huge 1- inch wheels. That RoushCharger gives the engine a total of 485 horsepower. Redfire 2005 Mustang Roush Sport owned by Clair Walter from Pennsylvania. It has many upgrades the 4.6L V8 with Roush supercharger, Roush body kit, Roush spoiler, and hood scoop. Clair also replaced the 18" Roush wheels, where the chrome was pealing, with 20" SVE Series 2 wheels.